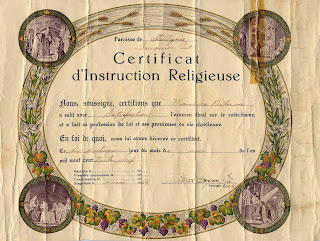 My late father Maurice received this document, a Certificat d’Instruction Religieuse (Certificate of Religious Instruction) 78 years ago today, on 18 May 1939. As a Roman Catholic, Dad learned his Catechism at school. (His first teacher was his mother, Julie, who taught him his prayers as a young child.) When it was time for his Profession of Faith, he and the other prepared students went to their parish church, Ste-Agnès (in Fauquier, Ontario), where family, friends and possibly members of the congregation gathered. After Father Arthur Doyon asked the children questions about their faith, they recited the Nicene Creed, a prayer symbolizing our Christian Catholic faith. In the early 1970s, the typical age for this Catholic rite of passage was 13-14 years old. I was 13½ when I made my profession of faith in June 1972, but Dad was only 11½ years old when he made his. The certificate measures approximately 22 cm x 30 cm (9” x 12”). Years of folding has left it wrinkled. Cellophane tape residue remains on a tear (8 cm/3”) in the top right-hand corner. The writing is readable, but faded. I think the certificate was kept rolled up in Dad’s dresser when I was growing up, and at some point, it was put in a frame. Mom gave it to me after he passed away. In the lower left-hand corner are fields for entering dates of one’s Baptism, First Communion, Confirmation, and Scapular. Only the last one, Scapular, is filed out. I know Dad was baptised (1927) and confirmed (1935), but I don’t know when he did his First Communion. Dad and the teacher who prepared the Certificat probably didn’t know the dates, so left those spaces blank. et a fait sa profession de foi et ses promesses de vie chrétienne. 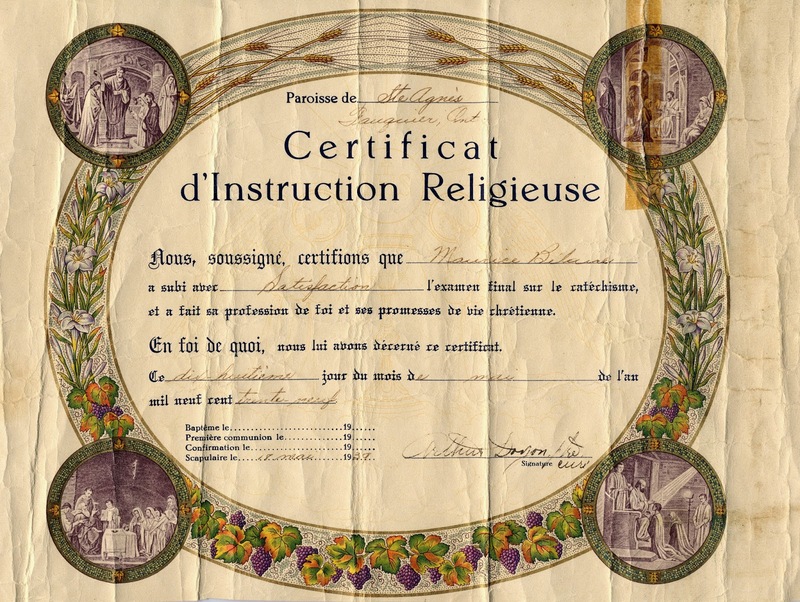 En foi de quoi, nous lui avons décerné ce certificat. and has made his profession of faith and of promises of Christian life. In witness whereof, we have awarded this certificate. 1. Reverend Peter M. J. Stravinskas, editor, Our Sunday Visitor’s Catholic Encyclopedia (Huntingdon, Indiana: Our Sunday Visitor Publishing Division, Our Sunday Visitor, Inc., 1991), 787, “Profession of Faith”. 2. A scapular consists of “two small pieces of cloth, about two and a half by two inches, connected by two long cords and worn over the head and resting on the shoulders”. Stravinskas, Our Sunday Visitor’s Catholic Encyclopedia, 868, “Scapular”. The Scapular that Dad received would have been a devotional one for lay people, not the kind worn by those in religious orders.